This project promotes the active involvement of Romani and non-Romani communities in ECEC services, through the development of toy libraries and intergenerational learning (IGL). Toy libraries are a successful approach to overcome segregation, provide access to quality non formal ECEC services that improve transition experience to formal education and build the capacity of parents. The project will organise IGL activities within toy libraries. IGL activities involve different age groups, including young children and senior adults, learning together and learning from each other. Previous research demonstrated that such activities challenge stereotypes and all involved experience the values of solidarity, respect and acceptance of the ‘other’. Discrimination against the very young and older adults is challenged. 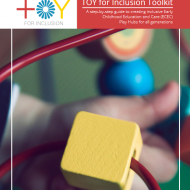 The TOY for Inclusion Toolkit is published! Segregation of Roma is determined by socioeconomic and historical factors, and has a detrimental effect on young children (and their families) in terms of their rights, development, and their future. The latest reports show a dramatic increase of Roma-only classes in spite of the authorities’ commitment to reduce the number of classes with Romani pupils only. 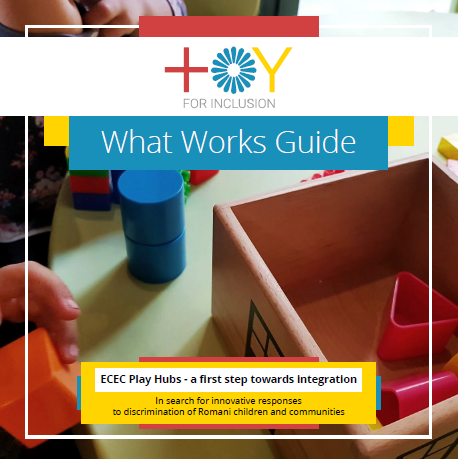 TOY for inclusion aims to improve the transition experience of Roma children to schools by offering an innovative response to discrimination of Roma communities by creating community based ECEC hubs (resource and meeting centers) in the form of toy libraries. This project is funded by the European Commission and the Open Society Foundations and will run from 2017 to 2019. TOY for inclusion will develop a training on community-based ECEC initiatives to promote inclusion in formal and non-formal ECEC settings through the development of toy libraries and intergenerational learning (IGL). We will develop a ‘What Works Guide’ with recommendations for practitioners and local authorities to implement community based ECEC for Romani and non-Romani children. We will also develop TOY libraries and IGL activities to bring together children and their families. Toy libraries have become a model of good practice for alternative ECEC programming, offering children not only place to play, but also help them develop necessary skills and knowledge for formal education. The impact of TOY for Inclusion will be that ECEC and Social Care practitioners from Roma communities will develop skills and competences to deliver successful IGL activities involving young children (Roma and non-Roma) and older adults, paying particular attention to social integration and intercultural and intergenerational dialogue. Toy libraries will overcome segregation, provide access to quality non formal ECEC services that, through family involvement and IGL, will improve transition experience to formal education and build the capacity of parents. TOY for Inclusion is the result of the cooperation between International Child Development Initiatives – ICDI (NL), International Step-by-Step Association – ISSA (NL) and six members of the Romani Early Years Network – REYN: Developmental Research Center for Pedagogical Initiatives Step by Step – DRCPI SBS (Slovenia), Open Academy Step by Step – OASS (Croatia), Centre for Education Initiatives – CEI (Latvia), Wide Open School – WOS (Slovakia), Centre for Innovation in the Early Years – VBJK (Belgium), Associazione 21 Luglio (Italy) and Partners Hungary.